They were sergeants it seemed. You need to be careful with that site. For instance, the 95th Rifles are depicted with 60th Rifles 'style' buglers. Last edited by Dibble201Bty; 05 Sep 13, 03:34. Cover it up again, quick, mate! Look at that "fahnensergeant's arm badge. Looks a bit familiar doesn't it, like a British colour sergeant? As you know, a colour sergeant didn't carry the colour, he protected the ensign who did. This poor fellow is in for a lot of trouble on the battlefield. First he doesn't have one of those jobbies that you carry a colour in, slung over the left shoulder, so he'd have to carry it in his dominant hand, unsupported, and he'd be unable to use his sword. The whole idea of a colour sergeant was to protect the officer carrying the colour, who was in the same position. When officers started carrying pistols, they could at least carry it in the left hand. Back in the day, when Digby was still Otto, there two Osprey Men-at-Arms volumes on the regiment, but the old one is OOP. Can you find the second one (#167)? I don't have one any more. Now that does pose a problem. That bugler looks wrong, but the rest of the uniforms are OK, so why would he make the bugler's facings different without good reason? Also, we know that this regiment, that would be separated from the infantry in 1816, liked to ape the light cavalry, and they, despite the regulations of 1812, still, like the 4th LD liked to put their buglers into fancy dress, so could this perhaps be a little known variant? The short answer is no. I searched whatever books on the 95th that I have, Carman and Barthorp's infantry uniforms, Thin Red Line and Waterloo Men as well as the usual internet sites, with no sign of a bugler of the period. Finally, I looked at one of your favorites, Paul, Uniforms of the Peninsular Army, Pl 12b and there was a 1808 bugler of the 95th dressed like the other ORs. Still not conclusive, but had I to choose between the European gentleman and Michael Chappell on a British Napoleonic uniform, I would choose the latter. Thanks for the exercise! You forgot Caldwell, Cooper and Dann. And don't forget Franklin's tome or the order that it was forbidden to repair any part of the uniform with red or white patches. Last edited by Dibble201Bty; 05 Sep 13, 21:41. Thank you for your very informative comments. The 28mm figures I plan to use are from Perry Miniatures. Checking the internet I find AB Miniatures have the same type of figure. The pompoms for men and officers are different according to my sources. Conical shape pointed at the top for men. Tufted inverted cone for officers. Information from TMP miniatures suggests it was sergeants used. I am left with certain uncertainities which on a 28mm figure may not matter too much?? Does anyone out there know anything at all about the patterns of British Napoleonic Infantry Officer's Saddlecloths? All I can find is that they're coloured "the Facing Colour of the Regiment, with a broad edging in the Regimental metal". But is this edging just one fat border, or is it doubled - and were there any badges displayed in the corners? The only pictorial reference I can find is this, by Simkin - But is it just for the 92nd (Gordon) Highlanders? 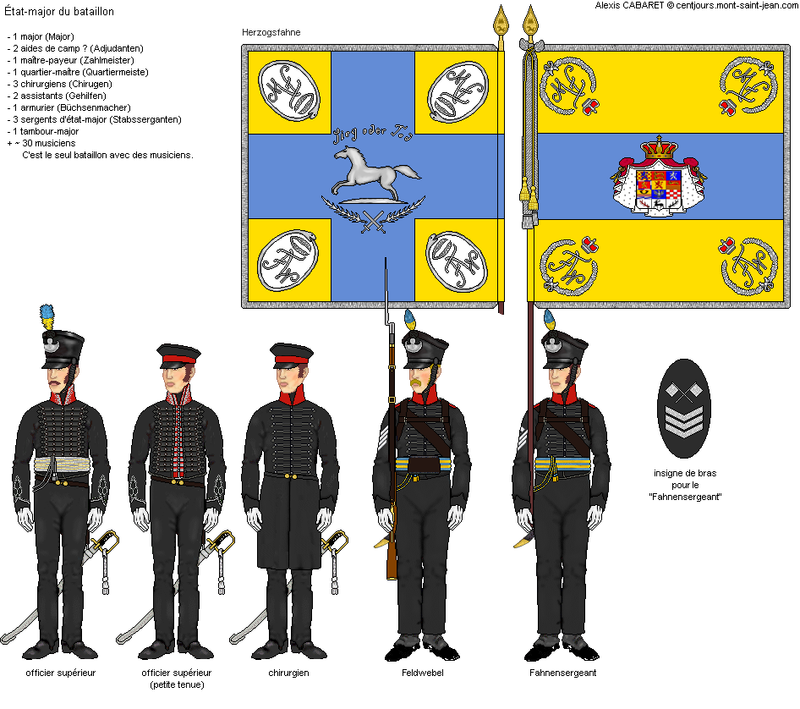 Also, what would the Saddlecloths of Major-Generals etc, etc look like - the same as for the Infantry or different? The shabraque was the regiment facing colour edged in the relevant gold or silver lace. The same goes for the pistol holster covers. 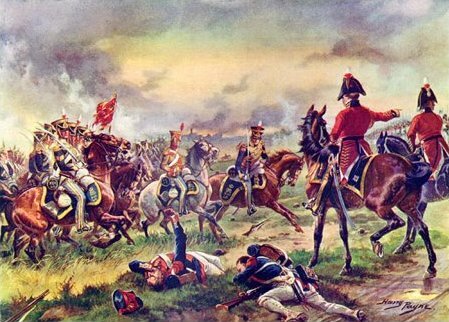 Mind you, If you are depicting those used at Waterloo, then I would say that it was anybody's guess. Last edited by Dibble201Bty; 12 Sep 13, 16:22. Hi Dibble201Bty, Many, Many Thanks. You are, as always, one of THE most helpful gentlemen I have ever been lucky enough to meet - Your very kind and thoughtful assistance is greatly appreciated and much treasured. Last edited by 95th Rifles; 16 Sep 13, 06:09. While I have a very small and short collection of similar FRENCH Illustrations (which I have previously shared within this ACG), I have never found any BRITISH (or other Waterloo-type Nationalities) and would dearly like to correct this omission. That watercolor was done by Herbert Knotel and was in the collection of Colonel John R. Elting until 2000 and are now in the possession of the West Point Museum. They were published in Napoleonic Uniforms, Volumes I-IV by Col Elting, and are under copyright. I would assume that you'd have to get permission to put them on an internet site, but I could be wrong. Col Elting had over 1,000 Knotel watercolors in his collection, which he had commissioned from Herbert Knotel. There were about fifteen group watercolors that were not in the books and were framed and hung in the Eltings' home. I was fortunate to be given two of them, one of the Mamelukes and one of the Guard Horse Artillery. The best thing to do for more Knotel watercolors is to purchase the four volumes. The Anne Brown military collectin at Brown University has some Knotels of the War of 1812. You can access them on line. A slight change of topic with the desire to add a little interest to a vignette. I'm trying to confirm how the French properly saluted. I've come across a number of examples in prints and paints, but the most startling I can't find right now. The salutes seem to be slight variations of what we're familiar with, but one example had a cavalry officer (lancer I think) with his palm out and hand above the peek of his head dress. Maybe some one in the know can shead a little light on the usual way to pass respects in Napoleon's army. Many thanks for that additional information - Massena. I'll certainly have a little look at The Anne Brown Military Collection - Cheers!!! The cavalry officer in your last picture is not a lancer. He is captain de Dreux-Nancré, ADC to general Gudin. Here some other example of French salute. Though there are some slight variations in the examples, the salute seems to be similar with the right hand, palm out and high in front of the forehead. Does anyone have a written source with reference to paying respects?